Based on this thesis, my partner Scott Friend (founder of Profitlogic) and I have been actively investing in this arena on behalf of our firm, Bain Capital Ventures. Bloomreach, cQuotient, Hooklogic and TellApart are among our recent early stage investments in this new category of marketing innovation. At the heart of each of these companies are CTOs and engineers that have experience with big data and modern techniques for data mining, analytics, and machine learning. These companies typically charge on a performance basis as opposed to charging traditional enterprise software license fees. And these companies are a having significant impact on their customer’s revenues and profitability. The world of enterprise application technology has gone through a number of iterations and evolutions over the past 30 years. In the late 70s and 80s, enterprise software consisted of mainframe and minicomputer solutions designed to handle various back office functions: finance, HR, and manufacturing. Over time, the winners in each of these functional applications areas: SAP (manufacturing), Oracle (financials), PeopleSoft (HR), began expanding into the adjacent categories spawning the ERP wave (enterprise resource planning). In the 90s, these companies became behemoths thanks to a concurrence of factors — the movement to client server infrastructure, the trendiness of corporate “reengineering,” the urgency around Y2K, and the growth of the large system integrators. As of 1995, the majority of enterprise software dollars were focused on back office functions while the sales and marketing functions were largely ignored or served by smaller point solution vendors. This opportunity led to the creation of several companies, including Siebel and Trilogy (the company I was with for 8 years). Siebel became a very large and successful company and was ultimately purchased by Oracle for $5 billion (its market cap at one point was over $60 billion). More recently, Salesforce has leapfrogged Siebel with its SAAS approach. With a market capitalization of $17 billion, it has become the new industry heavyweight. Note: Oracle value represents an estimate of only the value of their financial software application business. SAP represents estimate of the value of only their manufacturing suite. Siebel, Peoplesoft, and Taleo values are based on the prices at which those businesses were sold to Oracle. SuccessFactors value is based on sale price to SAP. Baan’s value is their peak market cap. Omniture’s value is based on sale price to Adobe. Intuit, Netsuite, and Salesforce.com values are based on public market values as of 2/27/12. Disclosure: Bain Capital Ventures was an early investor in Taleo. Historically, the challenge with marketing automation is that it has always been about “process” not about “data.” Back in the 90s, marketing apps were tools used to manage campaigns. More recent categories, such as email marketing or marketing automation, are focused on process automation — how to take a set of manual tasks and streamline them, track them or automate them. However, marketing-focused software solutions have never been about strategic data. 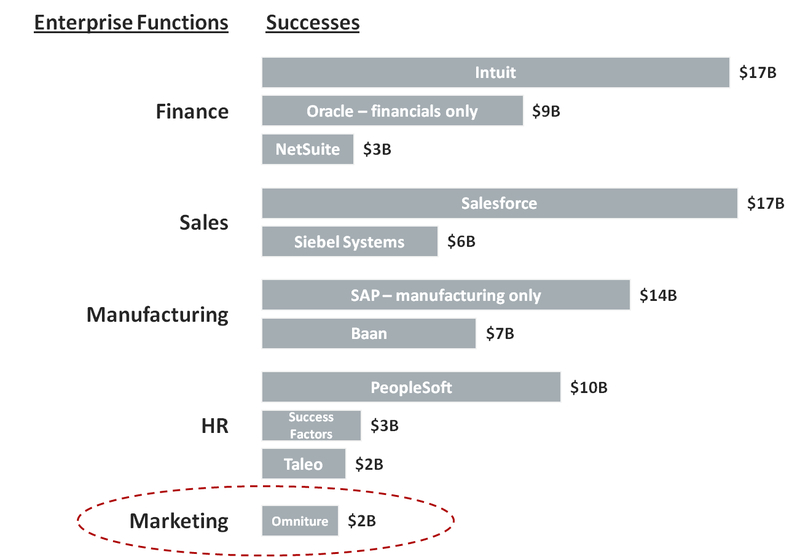 Unlike financial software, which serves as the system of record for the general ledger; or manufacturing resource planning software, which “owns” the bill of materials; or salesforce automation, which is the system of record for the pipeline and the funnel, there is no equivalent for marketing. Until recently, it has been difficult or impossible to collect structured data on marketing prospects who were not customers — folks who had not yet decided to buy and were still somewhere upstream in the purchase funnel. Absent this data, the best marketing technology could do was improve the process of decision making as opposed to delivering real insights. As more and more businesses across all sectors of the economy move to the web, this kind of data — and a massive amount of it — is finally available. A web business can mine thousands of signals from its prospects based on the hundreds of actions a consumer might take on a website (checking a price, looking at an image, reading a review, typing in a detailed search query, etc). The holy grail of closed loop marketing is finally here. With sophisticated technology and analytics, marketers can link customer acquisition spend directly to a set of downstream customer actions — whether those actions take place on the web, on a mobile device or in a physical location. Consumers with smart phones are conveying their intent while scanning QR codes, downloading mobile coupons, or simply walking into a store with their location-aware device. Social networks are providing a new source of demographic data that, combined with Facebook’s Open Graph, offer marketers a new treasure trove of information. I am excited about this next wave in enterprise technology. Marketing will finally emerge from the backwater and will give rise to several multi-billion dollar companies. Great post, Ajay. I wholeheartedly agree with your analysis and forecast. The web, TV and mobile are all heading down a much more addressable (reaching micro-targeted audience) marketing path. Tying subscriber/user demographics to mobile phone and other wireless-enabled device location based service data offers an opportunity for digital out-of-home media to become addressable as well. Such technology also enhances the credibility of its measurement, which has held it back from a larger share of ad/marketing dollars. The future is bright for more efficient marketing spend. Many companies are already developing their own marketing solutions in-house, until a simple yet robust solution exists, I find it very hard for companies to trust a cloud-service with their analytics and potential customer data. Also, what are your thoughts about targeting small businesses with marketing solutions as the ones you suggest to at least prove that the solutions work? completely agreed. Social networks are also increasingly being used as channels for customer support. This will be another addition to CMO mandate. This means big data tools geared towards Conversion Optimization/Marketing functions will gain in importance.